The Samsung Galaxy Note 10.1 wastes no time with Honeycomb and jumps straight to Ice Cream Sandwich. It's covered with TouchWiz, which adds more customizations to the interface than its Honeycomb counterpart. Before we begin, here is a video demo of the UI in action, which showcases the centerpiece of the Note 10.1,the S Pen. You're probably familiar with the ICS interface, but we'll go over it again and make a note of where Samsung tweaked things up. Let's kick things off with examining the four corners of the screen. The navigation keys are in the bottom left corner of the homescreen: Back, Home and Task switcher (plus a screenshot key courtesy of TouchWiz). The search shortcut is visible on all homescreens in the top left, the app drawer in the top right and finally, the notification area with quick toggles (again, a TouchWiz thing) in the lower right corner. The homescreen panes may look like default ICS homescreens, but they're not - the pinch gesture familiar from TouchWiz phones has been added to the Note 10.1 and it lets you add, delete and rearrange homescreens easily. The same pinch gesture can be used in the app drawer to again let you rearrange pages. You can't delete or add new pages this way though. The taskbar at the bottom has an arrow that flips up a row of what Samsung calls Mini Apps. The Galaxy Tab 10.1 had them too, so they're not new, but they're fairly unique in the Android world. Mini Apps are small, independent windows that are overlaid over anything else - homescreens, regular full-screen apps, anything. You can fit two or three of those on the large 10.1" screen and they really improve the multitasking abilities of the tablet. The screenshot button available in the bottom left corner can be quite useful in combination with the S Pen - once you've snapped a screen shot (you can press and hold the S Pen's button to do that too), it appears on the screen and lets you scribble some notes and save the image for later, share it or queue it up to print. The Samsung Galaxy Note 10.1 comes with tons of pre-installed apps - S Memo, S Note, S Planner, Social Hub, Music hub, Pulse reader, AllShare, Polaris Office, Video player, Video maker and My files. The Photoshop Touch and Adobe Ideas are a nice perk too, which we'll cover in more detail later. 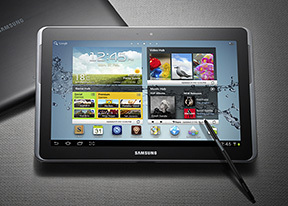 The Samsung Galaxy Note 10.1 is powered by an Exynos chipset with a dual-core Cortex-A9 @ 1.4GHz, Mali-400MP GPU and 1GB of RAM. The screen has 1280x800 resolution, which is about standard. In BenchmarkPi, the Note 10.1 is only a fraction slower than the Tegra 3-powered HTC One X (that's four A9's @ 1.5GHz). A pretty good result, but this particular benchmark isn't very multithread-friendly. Linpack is multithread friendly and the One X pulls ahead of the Note 10.1 by about 40%. That's far from double the performance, even though the One X has double the number of cores. Linpack results drop across the board when going from Gingerbread to Ice Cream Sandwich and the results for the small Note we have are from Gingerbread. When it comes to 3D graphics, the Mali-400MP GPU has repeatedly proven its worth and it offers very playable framerates. Note that the two phones - the One X and Galaxy S II - have lower resolutions,720p and WVGA respectively, which helps them get higher framerates.